"Absolem Hinshaw acquainted this meeting that he intends removing with his wife and family to America and desires our certificate of removal, and this meeting being informed that Alice Hinshaw also intends removing to America and desires our certificate, this meeting therefore desires Thomas Dawson and Jas Pillar together with Jas Morton and Jonas Shaw to make enquiries concerning the above mentioned Friends and bring the same to the next meeting for approbation." "William Henshaw signified to this meeting that he and his brother Jess, with their families intend to remove from this to America and desire our certificate. Thomas Dawson and Jas Pillar are desired to make the needful enquiry concerning them and return acct. how thay find things to next preparative meeting which is appointed to be held the 26th of 2nd mo." "Certificates being drawn for Jess Hinshaw, Absolem Hinshaw and William Hinshaw with their families, also for Alice Hinshaw, the same was signed in this meeting. Jonah Shaw is desired to record copies of said certificates and deliver the originals to said Friends." "It Appears that Jesse Hindshaw, Absolem Hindshaw & Willm Hindshaw with their respective families and also Alice Hindshaw removed to America in the year 1768". "Absolem Hinshaw received on a certificate". "Rebekah Hinshaw, wife of Absolem, & daughter Elizabeth, received on a certificate from Six Weeks Meeting, Grange, near Charlemount, Ireland, dated 3-13-1768". Note this certificate date is the same as that of William's. Great-grandfather Absalom Senior was a weaver in Ireland before the British suppressed the wool and linen trade, and left him without any work. In getting ready to leave for the New World he took his loom apart and left behind the heavy beams which could be replaced in America. He packed the reeds and small parts to bring along with him. As soon as a small home was built on Richland Creek he and Grandfather Absalom Junior re-assembled the loom. In those days, looms were so valuable as to be mentioned as legacies in wills. 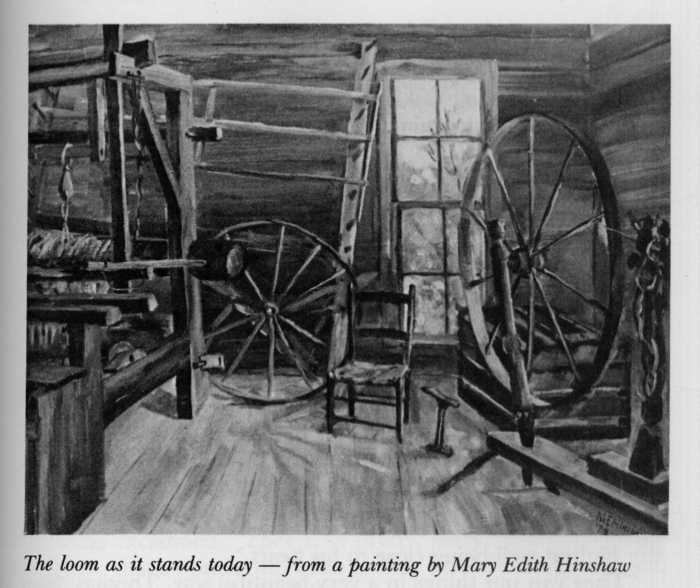 Absalom's loom eventually found its way into the home of great-great grandson Amos Stephen Hinshaw, where it still stands (as of 1982 at least), flax warp in place, although fragile with age13 (see photo link below). NOTE: There is some uncertaintly about exactly who were Absolom's parents. He is shown in this database as son of Thomas Hinshaw & Mary Marshall based upon numerous published genealogies which show them as his parents. But unfortunately there is little primary-source, hard evidence to confirm or refute this connection. 1. Absolom did travel with William and Jesse in making the ocean voyage from Ireland to North Carolina. 2. The discipline of North Carolina Yearly Meeting forbade the marriage of first cousins, and we know that Absalom, Jr. married a daughter of Jacob Hinshaw, in meeting. Also Absolom Sr.'s daughter Elisabeth married a son of Jacob Hinshaw. If their fathers (Absolom Sr. and Jacob) were brothers, these marriages should not have been permitted (theoretically). 3. In a letter dated 8 Mo. 8, 1784 William referred to Absolem as "Brother Absolem". However it should be noted that William (like other Quakers of his time period) used the word "brother" in a very inexact manner, not always referring to people who were truly a sibling. For example his letter of 1784 refered to "Brother John Cortney", who (apparently) was actually his brother-in-law, a brother to his first wife, Sarah Courtney. William's letter, addressed to "friend Thomas Greer", also refers to himself (William) as "thy affectionet friend and Brother". In a letter dated 20 January 1769 William said "let Jacob Haddock and Joseph Haddock know their two brothers and families is well, to wit Jacob Henshaw and William", who were (as best as is currently known) brothers-in-law, not actually siblings. Great grandson Thomas Hinshaw #326 kept a written account of some of his life experiences (his original writing is archived in the Rare Manuscript Room of the Perkins Library, Duke University),13 and passed-down much oral history to his descendents. 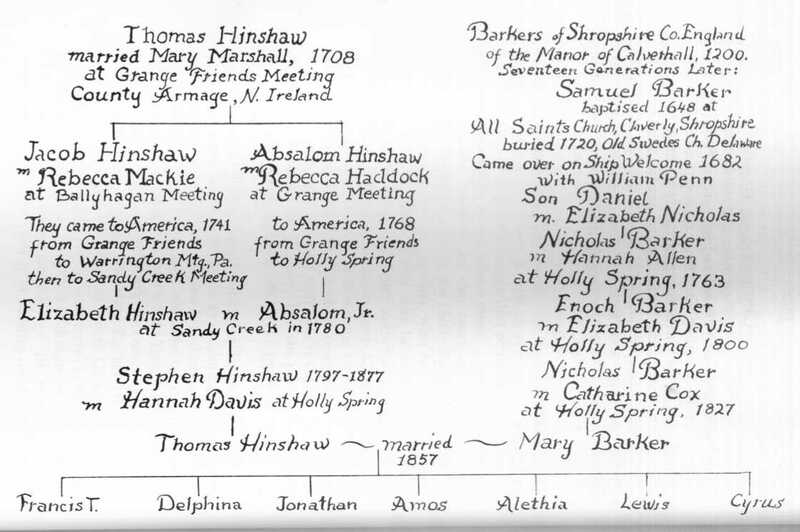 An extensive biography of Thomas Hinshaw #326 was published by grandson Seth Bennett Hinshaw, which included a descendency chart showing Absolem as son of Thomas Hinshaw & Mary Marshall (see the photo link below). Contribution from Mike Haydock ().